1.A. Our business relationship. These general terms cover my relationship with my clients. Some clients may have separate written agreements whose terms differ from or modify these terms; please refer to any separate written agreements I have made with you for additional or different terms and conditions. If you do not have a separate written agreement with me, these terms in whole cover your business transactions with me, and you agree to them when you engage me for any and all work. 2.A. Invoicing schedule. I generally invoice my clients when a requested project is completed and/or on or around the last business day of the month. These end-of-month invoices usually include all projects completed for the invoiced client during the preceding calendar month. However, I reserve the right to alter, without prior notice, my invoicing schedule. In particular, some large projects may billed separately or incrementally. 2.B. Expenses. Unless special arrangements are otherwise made in writing, fees and expenses I incur to complete my work for you will be your responsibility and will be billed directly to you. These costs will be approved by you in writing in advance of being incurred. You will be billed for all reimbursable expenses, together with receipts or other appropriate documentation of these expenses. This bill will generally be included in the regular invoice you receive from me (see ¶2.A above); payment for reimbursable expenses will be made by you by the due date of the invoice (generally within 30 calendar days; see §3 below). 2.C. Electronic invoicing. In most instances, I prefer to invoice my clients electronically via email. 3.A. Payment deadline. Payment for invoices from me is due upon receipt of an invoice. Invoices for which payment is not received by 23.59 (11.59pm) eastern time on the 30th calendar day following the date of an invoice are subject to late fees (see ¶5.B below). Regardless of how payment is made, it is the client’s responsibility to ensure that I receive payment before late fees begin to accrue. In particular, if payment is made by check (see §4 below), regardless of postmark, I must receive the check by this deadline. 3.B. Reminders. I will endeavor to remind clients via email of unpaid invoices before the due date. I do this as a courtesy and am not liable for overdue invoices if these reminders are not sent or are disregarded or misdirected. I suggest that clients check their spam filters to ensure that email messages from me arrive in the inbox. I am not responsible for email messages that are sent to spam folders or otherwise misdirected, unless an error was made on my part in entering an email address. 3.C. Extended due date. If your organization’s accounting department generally takes longer than 30 days to process invoices and payments, I can extend the payment due date for an individual invoice to 60 days for an additional fee of $5.00 or 1.5% of the invoice amount, whichever is greater. 3.D. Payments not received. If you fail to pay, or if you fail to pay by the deadline agreed to in my contract with you or pursuant to ¶3.A and/or ¶3.C above, you may be required to pay damages equal to double the value of the contract per the New York City Freelance Isn’t Free Act of 2016 (see ¶9.B below). Payment via credit card and PayPal should be completed online following the instructions found in your invoice. If you pay by check, you should mail your check to the address in the invoice you receive from me. 4.B. Additional payment methods. If you would like to fulfill your invoice with another method of payment, please notify me as soon as possible. I will endeavor to work with you to the best of my ability, though please note that I may not be able to accept all payment methods. 4.C. Payment by phone. I cannot accept payment by phone. 5.B. Late fees. Invoices that remain unpaid 30 calendar days after billing are considered overdue and are subject to a monthly late fee of $10.00 or 3%, whichever is greater. If your invoice has incurred one or more late fees, the fee(s) should be submitted with your payment for that invoice. An invoice that has incurred late fees but whose original invoice amount has been paid is not considered closed until all late fees are paid as well and will continue to accrue late fees at the highest applicable rate. 5.C. Fee for extension of payment due date. See ¶3.C above. 5.D. Collection fees. You agree to pay all reasonable attorney’s fees and/or other fees or costs if the account is placed with an attorney or collection agency for collection. 6.A. Ownership of copyright. I retain the copyright over the work I do for you until I receive payment in full from you, including late fees or court-imposed damages (see ¶9.B below), if any. Prior to receiving payment, printer-ready and other prepared files I send to you include a limited, revocable license for your printing, presentation, or other use of the work. Upon receiving payment, the copyright will transfer to you or your organization and I will retain a license pursuant to ¶6.B below. 6.B. Perpetual, royalty-free license. You agree that I retain a perpetual, royalty-free license to use the work I do for you, including drafts, in my portfolio, blog posts, publications, and other materials that I produce to showcase my work, highlight my skills to potential clients and others, or discuss my work processes. You understand that this portfolio and other materials may be in print and/or digital formats, including on the internet where it will be publicly accessible. This license is nontransferable without prior permission, verbal or written, from you. 6.C. Ownership of files. Unless consented to in a prior written agreement, I retain ownership of my copy or copies of the original or “native” files for the documents, artwork, and other materials I create for you. If you wish to receive copies of these files for your own records or use, I will provide them for a fee after I have received payment in full from you. Please note that your copyright does not give you ownership of my files, even when those files contain your copyrighted material; your copyright simply prohibits me from reproducing that work for purposes other than those in accordance with my license. 6.E. Outgoing correspondence. My outgoing correspondence to your organization, including emails and email attachments not subject to the terms above, are copyrighted by me and may not be duplicated for any purpose other than conducting your organization’s business relationship with me. 6.F. Creative Commons. Original content on my website, dtjoyce.com, is available under a Creative Commons license, unless otherwise noted. More information is available here. This section makes the full legal text of the Creative Commons Attribution 4.0 International (CC BY 4.0) license a part of these terms and conditions. 7.A. My logo. My logo and icon and variations thereof; my serpentine; my color palette; and other elements of my corporate visual identity are trademarks owned by me and may not be copied under any circumstances without my written permission. 7.B. Promotion discount. Where possible on materials I produce for you, I will include an unintrusive logo, URL for my website, and/or other identifier to promote my work to potential clients. In return, I will provide a 15% discount on my final invoice for that work. If you prefer that I not include such an identifier, or if it is not possible to include such an identifier on the material, I will remove the 15% discount from my final invoice. This is not applicable for incidental displays of my logo or other identifier, such as the watermark displayed over videos uploaded to my YouTube channel. 8.A. Independent contractor status. You understand that you are engaging me as an independent contractor. These terms and conditions, the business/working relationship between you and me, and my work for you are not intended to create any partnership, joint venture, co-ownership, agency, or employment relationship between us. Unless you and I specifically agree in writing, neither you nor I will act as an agent or make commitments on each other’s behalf. 8.B. Etsy shop. These terms and conditions do not apply to my Etsy shop, which is covered by policies that may be found here. 8.D. Time zone. Unless otherwise stated, dates and times in these terms and conditions and in my communications with you, as well as for purposes of deadlines and contracts, are in eastern time (UTC−5:00 during standard time and UTC−4:00 during daylight saving time). 9.A. Choice of law. My consulting work is a sole proprietorship based in Queens County, New York, United States of America. You agree that my relationship with you is subject to the laws and jurisdiction of the City and State of New York and the United States of America. In the unlikely event that litigation should be required, you agree that it will take place in the courts of the City and State of New York. Contracts or agreements with a value of $800.00 or more, including multiple contracts with a combined value of $800.00 or more over a period of 120 days, must be in writing. Payment must be made by the date specified in the contract or agreement. For contracts that don’t specify a payment date, payment must be made within 30 days after work is completed. Failure to pay in a timely manner may subject you to a penalty of double the value of the contract. Because I perform most of my work in New York City, this law likely applies to my relationship with you, contracts or agreements you and I enter into, and the work I do for you (see ¶9.A above). For more information on the law, visit the website of the New York City Department of Consumer Affairs. 9.C. Indemnification. I am not liable to you or any third party for damages, including lost profits, lost savings, and/or other incidental consequential or special damages, arising out of the work I do for you even if you advise me of the possibilities of such damages. You agree to defend, indemnify, and hold me harmless from any and all liabilities, losses, costs, damages, penalties, and any other expenses including attorney’s fees arising directly or indirectly from the business relationship between you and me. Additionally, you will indemnify and hold me free and harmless from any obligation, cost claim, judgment, attorneys, fees, and attachments rising from, growing out of, or in any way connected with the services rendered to you under these terms and conditions. 9.D. Waiver of counterclaims. You waive any and all of your rights to interpose any claims, deductions, setoffs, or counterclaims of any nature in any dispute with respect to these terms and conditions or my work for you. Any claims, deductions, setoffs, or counterclaims must be brought as a separate action subject to ¶9.A above. 9.E. Validity of digital version. 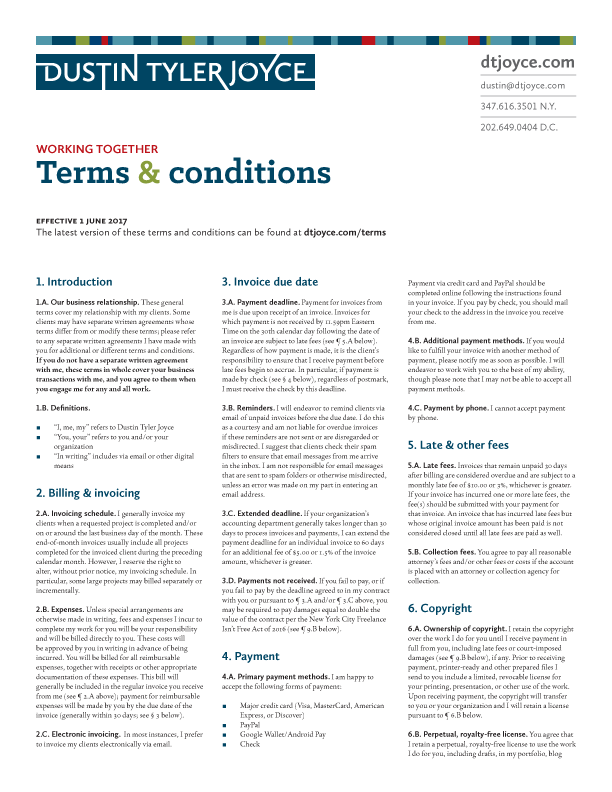 This digital version of these terms and conditions is valid and binding as if it were a printed version signed by both you and me. In the event of a discrepancy between versions of these terms, the current version posted in HTML at dtjoyce.com/terms shall be deemed the correct and valid version. 9.F. Changes in terms. These terms are subject to change. Clients should visit dtjoyce.com/terms for the latest version of these terms and conditions. I will endeavor to notify clients of changes in these terms; such notification may be in the form of a blog post, email signature, social media post, or other passive form of notification. Find out what's new and revised in this version of my terms and conditions.